Ever wanted to play the part of a giant monster wreaking havoc on an unsuspecting town, a la any B-Grade monster movie you've ever seen? You can, thanks to this 1986 Bally-Midway release. 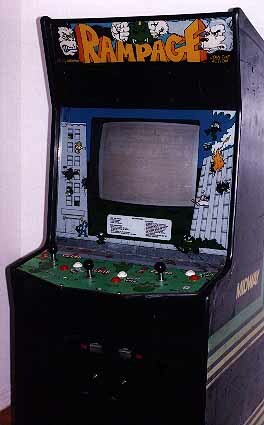 The game was released in an upright cabinet, accommodating three players simultaneously. George - A scientist with a bad reputation, he sought to develop a vitamin that would unlock the potential of the human body. He finally produced a compound which he called the "Mega-Vitamin". He decided to test the new formula on himself. Unfortunately, instead of turning him into a super human, it turned him into a giant gorilla with a mean streak! As a monster, his special abilities allow him to jump and climb better and faster than the others. Players playing George use the leftmost controls. Lizzie - A college student on spring break, she decided to spend her vacation at the lake. Unfortunately, the lake was recently the recipient of some very heinous radioactive waste. She dove in as a human and emerged as a towering Lizard with an uncontrollable hunger! As a monster, her special abilities make her the quickest and most agile of the monsters. Players playing Lizzie use the center controls. Ralph - A businessman in the sausage industry, he sent for rare and exotic ingredients from the Far East to "spice up" his Super Dogs. Unbeknownst to him, the ingredients mixed in just the right proportions created a powerful and dangerous formula. In a meeting to demonstrate the new Super Dog product, he consumed the first one and turned into a giant wolf with an attitude! As a monster, his special abilities makes him the strongest of the monsters. Players playing Ralph use the rightmost controls. You start the game with a monster and a damage meter. This meter measures how much health you have left. When the damage meter turns completely black, your monster falls to the ground and changes back into human form. If you have additional credits, you can turn back into the monster. Otherwise your human alter-ego walks to the side of the screen (naked, incidentally, with hands placed strategically to cover naughty bits) and disappears. The game has a series of 768 (!) levels. Each one is different and depicts the downtown area of a city, complete with buildings, vehicles, and in some cases, metro transportation. The object of the game is to level each city by destroying the buildings. To do this, the player jumps onto the side of a building, climbs up the side, and punches the building. This leaves large, gaping holes in the structure. Eventually, the structure becomes so weakened that the building topples to the ground. The level is over when all buildings have been destroyed. This game contains the Midway "Join The Action" feature, which allows a player to come into the game at any time provided that there is an open character to play and that the proper coins have been deposited. National Guardsmen - These guys lie in wait inside the buildings, and when the opportunity arises, stick their head and torso out a window. They can either shoot at you with their rifles or throw sticks of dynamite at you which explode upon contact. Helicopters - Swarms of helicopters fly around the city. They can either strafe you with their chain guns or drop bombs on you. It's best to destroy them before they have the opportunity to do either. Tanks - These large, lumbering vehicles drive around on the ground firing shells at you. If a shell hits you, it will knock you down, and if you're on the side of a building at the time, well... you get to take the express elevator down. Cops - These cop cars move similarly to tanks, but they are much faster and can fire shells more quickly. They give themselves away with their siren when they enter your area. Snipers - These paratroopers parachute in onto the top of the tallest building and lie in wait until the right moment, then pop up and let you have it with an automatic machine gun. Very nasty. Lightning - How about an Act of God to top everything else off? Yes, apparently The Big Man doesn't like you messing around with the natural order of things, as thunderclouds will occasionally appear at the top of the screen, lazily floating along and periodically lobbing lightning bolts in your general direction. During your impromptu excursions into "urban renewal", you'll find that the buildings contain a number of items which can either increase or decrease your damage points, or increase your score. There are also a number of special items. Turkey - A big turkey sits cooling on a window sill, just waiting to be gobbled up. Fruit - A basket of fruit is out ripening in the sun. Yummm! Hamburger - An edible, even without ketchup. Milk - They're right. It *DOES* do a body good! National Guardsmen - If you're careful, you can pluck these guys right out of their windows and chow down. Cuts down on the airborne missiles, and gives you health to boot! Flower Pot - A big sunflower sits in a pot. Knock it out of the window for points. Money - Grab the cash for points. Safe - Punch the safe to send it sailing to the ground. Grab the cash inside for points. Poison - A tiny skull and crossbones. Bad. Cactus - Doesn't go down nearly as well as the fruit does. Toilet - A disgusting porcelain contraption. With the lid down. Bathtub - Almost as disgusting as the toilet. Comes equipped with a ring that even the scrubbing bubbles have nightmares about. Bathtub with Man - Occasionally you'll come across a bathtub with a guy in it. If you don't reach in quickly to grab and eat him, he'll turn the shower nozzle in your direction and knock you off the building with a blast of water. Dynamite - Once you find this, you have only a second to leap to safety away from the building before it detonates. Otherwise it'll explode in your face and send you down to crack the pavement. Toaster - The electric variety, except this one seems to run directly off the 19.9kV street line. If you're patient, toast will pop out and you can eat it for health, but leave the toaster alone. Light bulb - A large bulb of the 1MW variety. Grab it while it's on and the filament won't be the only thing that glows. Grab it when it's off for points. Neon Sign - Same principle as the Light bulb. Found on the sides of buildings (in your way). Reporter - The Weekly World Examiner sent out their hack photographer for some snaps of you. He appears first only as a head, then sticks his whole body out to take a snap. Grab him and eat him quickly before his flash goes off, blinding you and sending you back to the street. Lady in Nightie - George. It's a Fay Wray/Jessica Lange thing. Bald Guy in Boxers - Lizzie. Who knows? Maybe she's got a thing for Patrick Stewart or something? Businessman - Ralph. Must be the guy at Ralph's sausage company that had him fired after the Super Dog fiasco. Truck and Taxi - Rubber necking at the carnage on Main Street. Give 'em a little taste of what you'd like to give 'em in real life. Train - Only shows up on levels that have tracks on them (duh). If you've got a fellow monster playing with you, you can play a quick game of "Pass the Train" for bonus points. Sewer Worker - Pops his head up every once in a while from a manhole. Punch the manhole while he's taking a peek to send the manhole cover flying. The upright cabinet contains a Wells-Gardner 19" Color Dual Sync Horizontal monitor (part# 0017-00003-0465). The control panel consists of three sets of controls: one Monroe 4/8-Way Joystick, one white push button (Start/Jump), and one red push button (Punch), one set for each player. The "monoboard" PCB is mounted on a panel directly in front of the coin door/box area (as viewing the game from the rear). To the left, mounted on the side of the cabinet is the "Sounds Good" audio PCB which runs into the dual power amp directly above it. Rampage has so many neat little tricks and humorous sidebars that they're too numerous to mention. Next time you play one, try timing your flowerpot, safe, or manhole cover punch. If a tank, helicopter, or cop car is in the path of the falling object, it's history. "Property Values at All Time Low"
"National Guard Looking For Volunteers"